Email transmission between servers has historically been extremely insecure. A new draft internet standard called “SMTP Strict Transport Security” or “SMTP MTA STS” is aiming to help all email providers upgrade to a much more secure system for server-to-server mail transmission. This article lays out where we are currently in terms of email transmission security and how SMTP MTA STS will help. Email servers (a.k.a. Mail Transmission Agents or “MTAs”) talk to each other using the Simple Mail Transmission Protocol (SMTP). This protocol, developed in 1982, originally lacked any hint of security. As a result, a lot of the email shooting around the internet is still transmitted in plain text. Its easily eavesdropped on, easily modified, untrusted and not private. Back in 2002, an extension to SMTP called “STARTTLS” was standardized. This extension permitted servers to “upgrade” SMTP communications from plain text to an encrypted TLS-secured channel, when both servers supported compatible levels of TLS. This process is known as SMTP TLS. In principle, this security addition was really great. The “TLS” used is the same encryption method used by your web browsers to talk to secure web sites (e.g., banks, Amazon, your email provider, etc.). Your web browsers do relatively good job making sure that connections to these secure sites are safe. I.e., they seek to ensure that there is encryption, that the encryption is sufficiently strong, and that there is no one actively eavesdropping on your connections. TLS protocol and cipher configuration. The TLS encryption protocol has evolved over time and there are many different mathematical methods for encrypting information. The choices made by the server administrator with respect to which encryption methods (ciphers) will be supported and which versions of the TLS protocol are installed have a large impact on the potential strength of any secure connections made to the server. With TLS certificates that do not match the domain names of those servers. With TLS certificates that are not even issued by trusted third parties. With support for very weak/poor encryption ciphers and/or lack of support for the new and really good ones. Weak encryption: The encryption used will be very weak / insecure. A passive eavesdropper (i.e., someone who can listen to the communications but not modify it) may be able to record the transmission and decrypt it. No authentication. Because the TLS certificates are often invalid or not trusted, the TLS certificates are generally not verified by the sending servers. The sending servers have no proof that they are actually talking to the server to which they are trying to connect. The man-in-the-middle could modify the transmissions to remove TLS encryption or to force use of a very weak cipher or protocol. In short — traffic to really old/poorly configured mail servers can be passively eavesdropped on and any man-in-the-middle between the two email servers could have full access to the transmitted email data. All inbound email servers support TLS 1.0+ and at least some good ciphers from the NIST 800-52 r1 or r2 lists. This means that 17.7% of the domains to which people are sending email do not have any TLS support or are in some way seriously deficient. For SMTP STS, the bar is higher than “minimally sufficient.” The inbound email servers for domains participating in Strict Transport Security must also support TLS v1.2 and utilize TLS certificates that properly validate and are trusted. 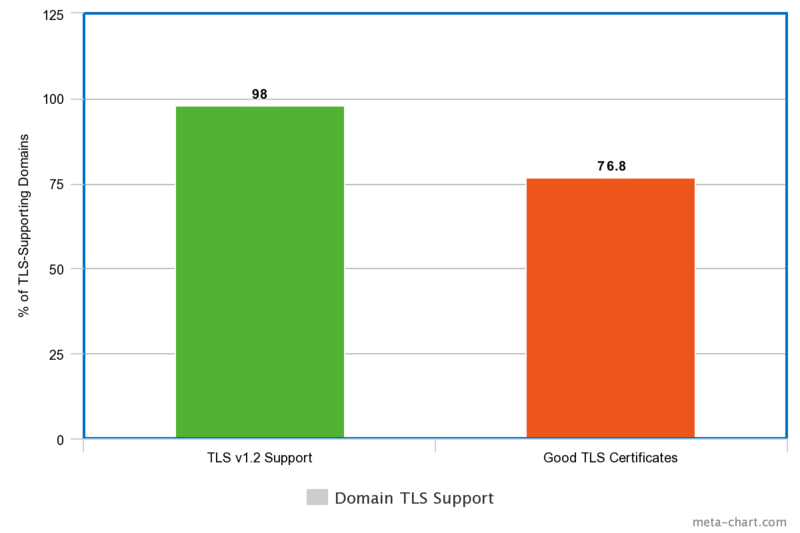 Looking at all the “minimally sufficient” domains, LuxSci found that 98% of them do support TLS v1.2; however, only 76.8% of them have TLS certificates that can be validated and trusted. So — a significant number of domains still do not have usable TLS for inbound email and about a quarter of those that do can not be trusted. 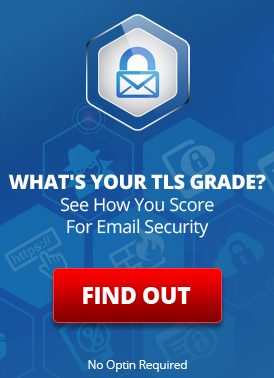 Email service providers need to start with updating the TLS certificates used by their email servers. LuxSci’s “Forced TLS” service automatically checks all of the MX records for a domain to make sure that all of them support TLS and good ciphers (i.e., have “minimally sufficient SMTP TLS”). It them locks down its configurations so that email will not go to that domain without good TLS encryption. This prevents insecure email delivery due to server misconfiguration or protocol downgrades. Some providers allow you to manually “Force TLS” on a per-domain basis by specifying domains to which email must be delivered over TLS. Some providers also allow you to manually enable TLS certificate verification on a per-domain basis to prevent many types of man-in-the-middle attacks. Of course, this requires that the recipient’s email servers actually have their TLS certificates setup properly and also requires a lot of continuous manual work. 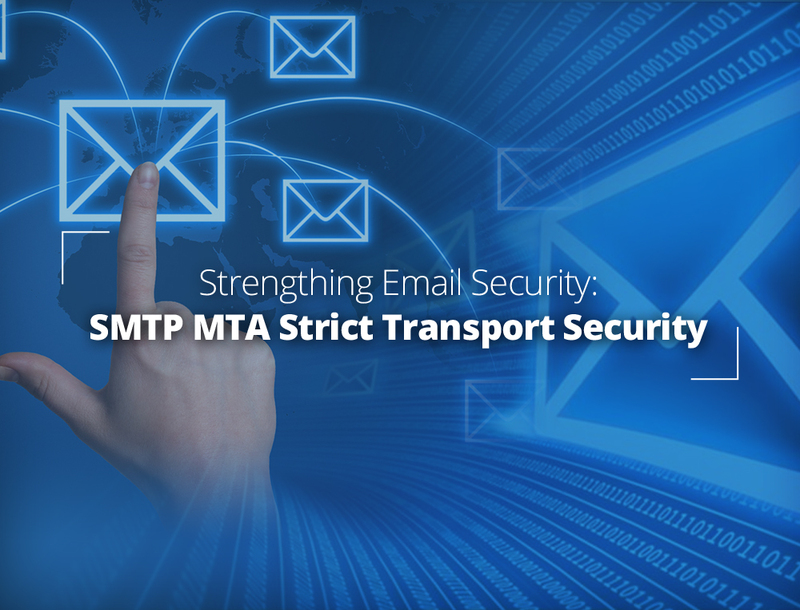 The SMTP MTA Strict Transport Security draft specification is designed to address many of these security issues without breaking the existing email infrastructure. Here is an overview of how it works. Match the domain name used by their inbound email server (as per the DNS MX records for example.com). Are signed by a trusted third-party TLS certificate authority. Check and see if the DNS TXT record for “_mta-sts.example.com” exists and is setup properly. Read the DNS MX records for example.com to see what servers accept example.com’s email. Send the email via the usual methods. This could result in insecure or secure email delivery. We have left off the minor details of the SMTP MTA STS protocol for simplicity. However, as you can see Strict Transport Security paves the way for (a) recipient servers to upgrade their security, (b) recipient servers to securely inform sending servers that they are support STS-levels of transmission security, and (c) sending servers to discover this information and to use it to enhance the security of SMTP connections over TLS and to protect them from most of the deficiencies in the current state of SMTP TLS usage across the internet. SMTP MTA STS also allows the current email delivery ecosystem on the internet to function “as is” while security improvements are bootstrapped as providers gradually implement support for Strict Transport Security. What are the down sides of SMTP MTA STS? Loss of email. If your enable STS and one or more of your inbound email servers is not appropriately configured, you will lose email until you fix the server or adjust your STS configuration. This is not a big concern as STS configurations can be adjusted very quickly. Injected MX records. If an attacker can modify the DNS responses received by the sender’s servers, the attacker can possibly add MX records that are not covered by STS and which will deliver email to the attacker’s own server. Blocked TXT records. If the attacker can modify the DNS responses received by the sender’s servers, the attacker can block the STS TXT record. This can cause the sender server believe that the recipient’s domain does not support STS (depending on the state of the sender’s STS cache). Rogue TLS Certificates. If an attacker can get a TLS certificate signed by a trusted third party for the recipient’s domain, then the attacker can still be an active man-in-the-middle. So, while SMTP MTA STS is not perfect, it does significantly reduce the range of possible attacks on TLS-secured email transmissions while also encouraging email providers to make sure that their SMTP TLS support is well configured. How does LuxSci use SMTP MTA STS? LuxSci’s inbound email servers all support TLS v1.2, strong TLS ciphers, and their TLS certificates validate. LuxSci has enabled SMTP MTA STS for its primary domains: luxsci.com, luxsci.us, and luxsci.net. We can assist any of our customers in setting Strict Transport Security up for themselves as well (though a secure web site will be needed). Additionally, LuxSci is updating the dynamic Forced TLS email delivery process included with its SecureLine email encryption service to be MTA STS-aware. In additional to only using strong ciphers for email delivery (which is already the case), LuxSci will automatically require TLS certificate validation for email delivery over Forced TLS to any recipient whose servers have SMTP MTA STS enabled. No end-user configuration is required — the security enhancement happens automatically and seamlessly in the background. This entry was posted on Wednesday, July 25th, 2018 at 11:51 am	and is filed under LuxSci Library: Security and Privacy. You can skip to the end and leave a response. Pinging is currently not allowed.